Looking for Italian restaurants in Clark NJ? 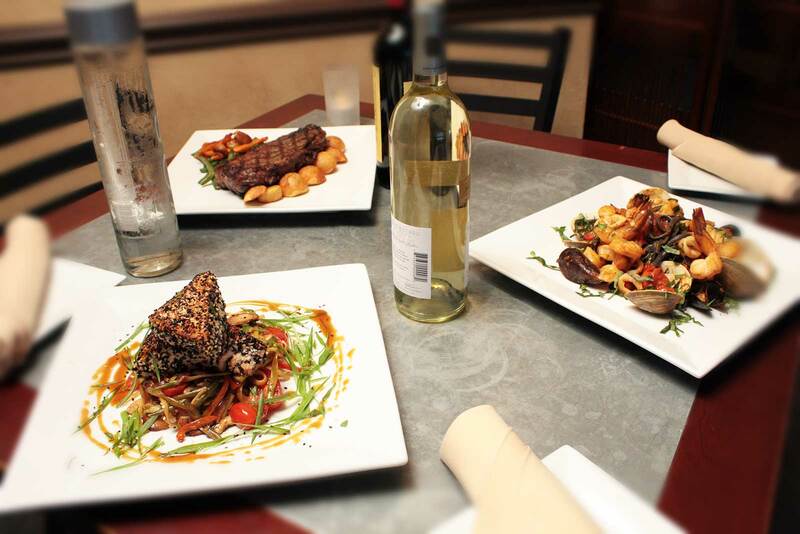 You have found the best at Bistro 1051 located in the Clarkton Shopping Center along Raritan Road. With a state of the art new kitchen and award winning casual but trendy decor, Bistro 1051 stands out among Clark NJ Italian restaurants. Our customers have the choice of dining in one of two beautiful dining rooms - under the antique tin ceiling with recessed lighting or under the sun or the stars in the glass atrium room. With both adorned with dark reclaimed woodwork, exposed brick walls, black granite bar, antique light fixtures and Asian black porcelain floors, you cannot make a bad choice! Come on in to one of the best Italian restaurants in Clark NJ and see for yourself. Bistro 1051 is much than the other traditional Clark New Jersey Italian restaurants, we also have a sushi bar, backed by mosaic glass tile. Bistro 1051 is also proud to feature Alfresco dining! We have plenty of parking day or night and the building is accessible to people with disabilities. Pressed for time? No worries - Bistro 1051 also offers a delivery service. Reservations are suggested on weekends. Bistro 1051 is one of the best Italian restaurants in Clark NJ & so much more! A myriad of creative salads and appetizers - such as calamari salad with miso citrus vinaigrette, pear endive with walnuts and aged Roquefort cheese, crab cakes, sweet glazed beef skewers, and an assortment of brick oven flat bread, tables accented by candlelight create a collage of eclectic fare. Dinner entrees follow and include such delicacies as sesame crusted salmon, miso glazed chilean seabass, pastas, chicken, veal and steaks. If you're in the mood for sushi, try the tuna tartar - chopped tuna with caviar, onions, scallions and spicy sauce or one of the specialty rolls, such as the 1051 roll which features shrimp tempura, spicy tuna, soybean paper and spicy mayonnaise or the Bistro roll which features shrimp tempura topped with seared salmon and spicy sauce. Fresh sushi and sashimi are also available a la carte or as entrees. The dessert list at Bistro 1051 offers tempting treats, including chocolate flourless torte with raspberry reduction and fresh vanilla ice cream, fudge brownie with vanilla bean ice cream profiteroles, black and white mouse and the signature dish, the "lava cake" a dark chocolate cake with molten chocolate center, served warm. Daily specials are also featured. Bistro 1051 has also become a favorite for Lunch. The menu includes an assortment of salads, wraps, and entrees, such as chicken, veal and seafood. You may want to try the grilled "Bistro Burger" with caramelized onions, smoked bacon and aged cheddar. Sushi is also available. Diners are invited to bring their own wine or spirits. Bistro 1051 even has all the necessary mixers to make your favorite cocktail, such as sangria. Bistro 1051 is located in the Clarkton Shopping Center along Raritan Road that formerly housed The Rice Bowl. It has been refurbished with a state of the art new kitchen and award winning decor to reflect a casual but trendy ambience. Adorned with dark reclaimed woodwork, exposed brick walls, black granite bar, antique light fixtures and asian black porcelain floors, patrons have the choice of dining in one of two rooms - under the antique tin ceiling with recessed lighting or under the sun or the stars in the glass atrium room. There is also seating at the sushi bar which is backed by mosaic glass tile. Bistro 1051 also features Alfresco dining - coming this Spring. There is plenty of parking day or night and the building is handicapped accessible. Pressed for time? No worries - Bistro 1051 also offers a delivery service. Reservations are suggested on weekends as it tends to get crowded, as patrons dine on delicious cuisine.